If you are coming to the Whitsundays, you have no doubt seen images of spectacular Whitehaven Beach and Hill Inlet Lookout. 7km’s of pure white silica sand stretches along beautiful Whitsunday Island. Consistently voted as the best beach in Australia and one of the best beaches in the world, you really don’t want to miss your chance to visit this iconic location. Cruise Whitsundays offer a full day trip to Whitehaven Beach from Hamilton Island, this allows you to spend the maximum amount of time enjoying this breathtaking spot. With a full day, you have the opportunity to take the walk to Hill Inlet where you can soak in the picture perfect views from the lookout! You will also have the chance to snorkel and play beach games with other guests, or just take a leisurely stroll at your own pace. If you would prefer a shorter trip, a half day option is also available. Contact Whitsunday Holidays to book your cruise to Whitehaven Beach today! 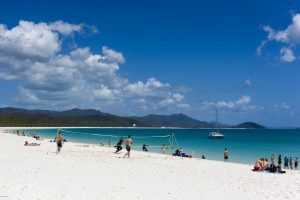 See the Cruise Whitsundays Whitehaven Beach Brochure here. See the absolute best of the best! Walk up to the Hill Inlet lookout, chill out on Whitehaven Beach and explore the beautiful Chance Bay. What an amazing day out. This day cruise allows you to spend more time exploring the wonders of Whitehaven Beach than any other cruise. Lunch included!